The PHH152 model has been discontinued. Please see the PHH-7000 Series as a possible alternative or contact our Flow Engineering Department. 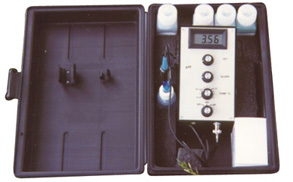 The PHH-152 measures the pH/mV of most solutions. The meter includes all the functions necessary for precise and accurate pH/mV measurements, including set and slope knobs for two or three point calibration, a manual temperature adjustment allowing for temperature compensation and a 3 1 /2 digit display. Rechargeable batteries and an ac adaptor/charger allow versatility for use in the field and in the lab. The batteries will last approximately 400 hours before recharging is required. The LCD display display will give a “BAT” reading to indicate when the batteries are low. Please download the PDF file below for full product specifications. 참고: Kit come complete with Meter, Electrode, 3 sample vials of pH4, pH7, and pH10 buffers, 1 sample size vial of Deionized Water, rechargeable batteries, power adaptor, carrying case and operators manual.